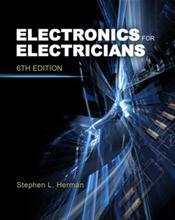 The Sixth Edition of ELECTRONICS FOR ELECTRICIANS is a practical and relevant guide for anyone preparing for a career in industrial settings. With its updated graphics and increased coverage of important topics, this book helps readers understand components and circuits in terms of how they work, what they do, how to use them, and how to test them. Review questions and problems in every chapter expose readers to the electronic devices commonly found in industry, as well as the circuit applications of those devices.